Workplace discrimination comes in many shapes and forms. It is important to keep in mind that at no point is it acceptable for an employer to discriminate, such as fire or demote an employee, based on race, color, creed, nationality, gender, sexual identity, family or pregnancy status, age, disability, or religion. Such discrimination falls under the jurisdiction of the Equal Employment Opportunity Commission (EEOC). 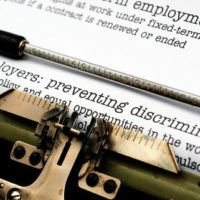 This means that an employer who discriminates against an employee based on one or more of these bases may be sued for damages, but what is the relationship between discrimination and workers’ compensation? More specifically, what happens when an injured worker who receives workers’ compensation benefits faces discrimination by his/her employer for that claim? May the employer refuse to take him/her back, or intimidate or terminate him/her? May the injured worker prosecute both a workers’ compensation case and discrimination case including workers’ compensation retaliation? Read on for the answers. An employee injures his/her knee becomes injured on the job due to lifting heavy objects and receives workers’ compensation benefits. The employer then refuses to keep that employee because the employer fears that the employee will reinjure the knee and file for workers’ compensation once again. In this scenario, the employee’s injury would fall under the ADA’s category of “disabled,” and the ADA would protect against workplace discrimination. Similarly, if an employer did not hire a worker because of their workers’ compensation history, which they never have a right to ask about, that would also fall under workplace discrimination and be protected by the ADA. If you are struggling with disability and discrimination, do not hesitate to contact the West Palm Beach law offices of the Celeste Law Firm today to discuss your situation with one of our disability and workplace discrimination attorneys. We are prepared to help you today.